The Oxygen generated is 92 to 95% pure. 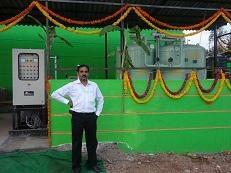 ATMOS POWER PVT LTD experience & know-how in the design & manufacturing of oxygen generation plants by VPSA technology. 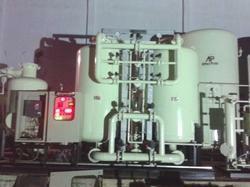 We offered oxygen gas generators work with VPSA (Vacuum Pressure Swing Adsorption) technology. Using this technology,we produce oxygen gas generators that are low on maintenance & highly economical while they produce the desired results in a hassle-free manner. The process of producing oxygen from oxygen plant involves taking air from an air compressor,separating oxygen from nitrogen and other gases by means of special ZEOLITE MOLECULAR SIEVES. The system gives a continuous supply of oxygen by automatic switching towers on a timed cycle.It can be adjusted for oxygen purity up to 93 % although the most economical for practical purposes is 85 % & above.In the process of regeneration, the adsorbed nitrogen is subsequently discharged as waste.The resulting product gas is around 95% pure oxygen available at around 2.5 Kg/cm2 g pressure.The gas is very dry containing little or no moisture. Oxygen- enhanced combution is used in many different applications including GLASS manufacturing, Ferrous & Nonferrous metal processing,waste incineration,sulphur recovery,fluid catalytic cracking & process. (1) New Applications are emerging in the production of Bio Fuels. (4) As well as in OXY-COAL combustion with CO2 capture. (1) Increase Efficiency :- The fuel gas heat losses are reduced because the fuel gas mass decreases as it leaves the furnace. (2) Lower Emersions :- Certain burners & Oxy-fuel fired systems can achieve lower levels of nitrogen oxide, carbon monoxide & hydrocarbons. Increasing the OXYGEN content allows more stable combustion & higher combustion temperatures that can lead to better heat transfer. Looking for VPSA Oxygen Generator ?